Wow time flies by when your having fun, and I always do when I'm doing something that I love and that would be creating. This week the challenge is Anything goes, easy theme . You should be able to create and share a card with us this week - Right. I hope to see your card posted on the Whimsy inspires blog for a chance to win some terrific images , don't let digital stuff scare you. I know it can trust me I was terrified the first time I used digital but it's easy and fun you should try it. Maybe this week? 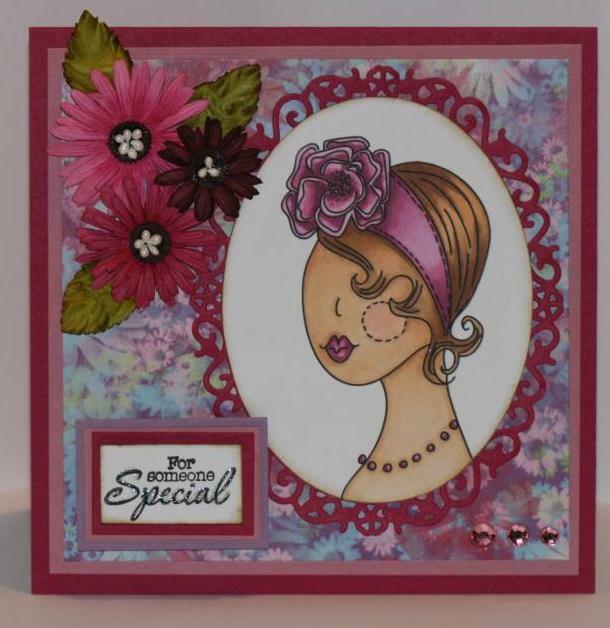 I hope so , I decided this week to use a Livy Bo image - Flappy Hat from Whimsy Stamps. I love this image reminds me of like the 50"s and history. A very intriguing time. You should click here to jump over to the Whimsy blog to check out the other DT's wonderful cerations as well. This is my card for this weeks challenge. A bit of a closer look at my colored image. Supplies: Livy Bo image from Whimsy, Copic markers, Bazzill cardstock, Spellbinders, Prima Marketing flowers, Bo Bunny bling.